Please measure your wrist using a piece of string, leaving room for at least one finger to easily fit between the string and wrist. You should choose a length you feel comfortable with. This bracelet is strung on nylon and is knotted between each bead. Colors do vary slightly due to the nature of amber and the lighting during the photo. 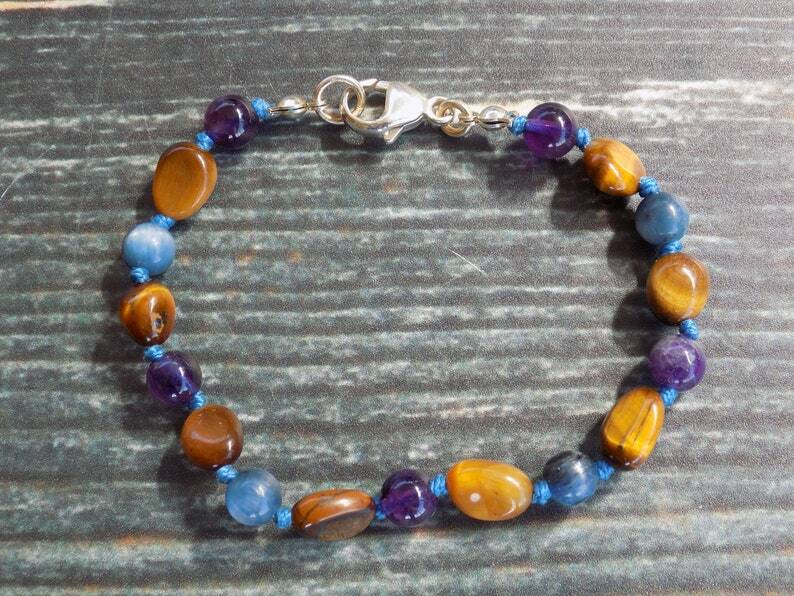 To Read More about the Gemstones contained in your bracelet, visit https://www.facebook.com/notes/momma-bean-stalk/gemstones-i-have-around-and-their-uses/390634854376930. If you need a slight variation in the findings, such as an extender added, please send me a message after your purchase to discuss this. Some changes may require a small fee. This bracelet is intended to be worn by an adult. Buyer assumes all responsibility for the safe and proper use of this product and should occasionally check the product for wear and tear. By completing the purchase of this piece you are acknowledging that you have read and accept all Momma Bean Stalk, LLC Policies https://www.etsy.com/shop/MommaBeanStalk/policy. Love it!! Thank you so much! It looks beautiful on my little squish! Love it 😍 ! All of Bekah's jewelry is super high quality and just beautiful!!!!!! It’s beautiful it’s a gift for my best friend and she’s been waiting for another one since she lost hers. I accept payment via etsy's Direct Checkout with your credit card or via PayPal in US dollars. I also accept etsy gift certificates. In Stock orders may be cancelled before they have shipped. Once an order has shipped, it may not be cancelled. Custom Orders and custom order deposits may not be cancelled or refunded. Please be mindful in your purchase in sizing and understand that natural stones come in a variety of shades and the product you receive will have a different appearance than the picture in the listing you ordered. I do my best to accurately represent each product I offer. I do my best to pack all items with care to ensure they arrive to you intact. Each item is carefully inspected before shipping to guarantee the highest quality product possible. If your item is damaged when you receive it, please contact me immediately so we can work out a way to replace it as quickly as possible. Children's necklaces are strung on high quality beading silk. To ensure the longevity of your silk do not get it wet, do not exercise in it, do not swim in it, do not pull on it, and take it off before pulling items of clothing over your head, arm, leg, or other body part where the jewelry is worn. It is normal wear and tear for Baltic Amber and gemstone beads to break when pressure is applied to at least two sides of the bead. Baltic Amber is fossilized tree resin and is fragile. It cracks easily and and break easily. Losing a bead or beads does not warrant a free or discounted replacement. The silk necklaces will break if pulled on, especially if they have gotten wet repeatedly. Broken necklaces may be repaired on an individual basis, but breaks do not warrant a free or discounted replacement. Due to the nature of the product and personal use of jewelry, refunds and returns are not available. Please make sure that you have accurately measured the area on which you are placing the jewelry. Ordering the correct length is the customer's responsibility. Returns or exchanges will not be accepted because you purchased the wrong length. If you feel the product you received does not match its description or was grossly misrepresented, please contact me immediately and we will work together to find a solution. I ship all in stock items via USPS First Class Mail with tracking and insurance within 1-3 business days of receiving a paid order. A shipping upgrade to priority shipping is available to be purchased as a separate listing. When your order is completed and shipped, you will receive a confirmation email with applicable details and tracking information. International packages are sent through the United States Postal System and cannot be tracked after they leave the US. I cannot be responsible for lost international orders. Because of USPS being a third party courier, I CANNOT guarantee that you will have your item by a certain time. USPS usually does pretty great, but if an issue arises with delivery you and I will work together to resolve the issue. If an item is marked as being Delivered in the tracking, but you claim to have not received it, I will not provide a free or discounted replacement. It will be up to you to follow up with the post office and postal carrier. It is your responsibility to ensure that your etsy shipping address is correct BEFORE you place your order. If you need to edit your address, a new shipping label may be purchased for $.50 after discussing the address edit with me via private message. I am not responsible for items that are shipped to an incorrect address. Follow me on Facebook for up to date pictures and information about stockings at www.facebook.com/MommaBeanStalk. Do not bathe or swim in your jewelry. When the silk used in the children’s jewelry and some adult jewelry gets wet, the weight of the beads will stretch the silk out. This makes the necklaces longer and weakens the silk. The moisture will weaken the knots that hold the plastic screw clasps on. Avoid using soaps and lotions with your jewelry. They can create a film on the beads that keeps the Baltic Amber and healing gemstones from lying in direct contact with your skin. If a film forms on your jewelry, gently rub the beads with a soft cloth. If you need a more deep clean, use a wet, soft cloth and a gentle soap to clean your jewelry and lie it flat to dry. Do not pull on your jewelry. Do not play with your jewelry. This pulls on knots and clasps and causes friction and will wear the cording out. Knotted jewelry made on beading silk often stretches about a half an inch due to gravity and wear and tear. Please account for this in your measurements. The Amber beads, gemstones, and hazelwood are not intended for chewing. Each Bead is knotted individually to reduce choking hazard in case a breakage occurs. Please use responsibly and always under adult supervision as beads may pose a choking hazard. Items with small pieces or parts are not recommended for children under 3 years of age. Buyer assumes all responsibility for the safe and proper use of this product and should occasionally check the product for wear and tear.